Larry the rescue cat lives at 10 Downing Street, and although he doesn’t do much in the way of policy, he has become the furry face of a more relatable U.K. government. 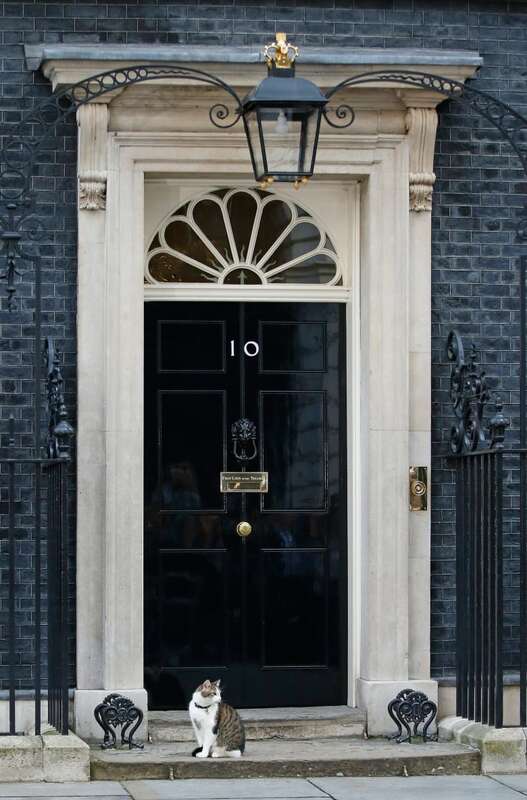 Past the heavily guarded gates of Downing Street in central London, through the famous black door at No. 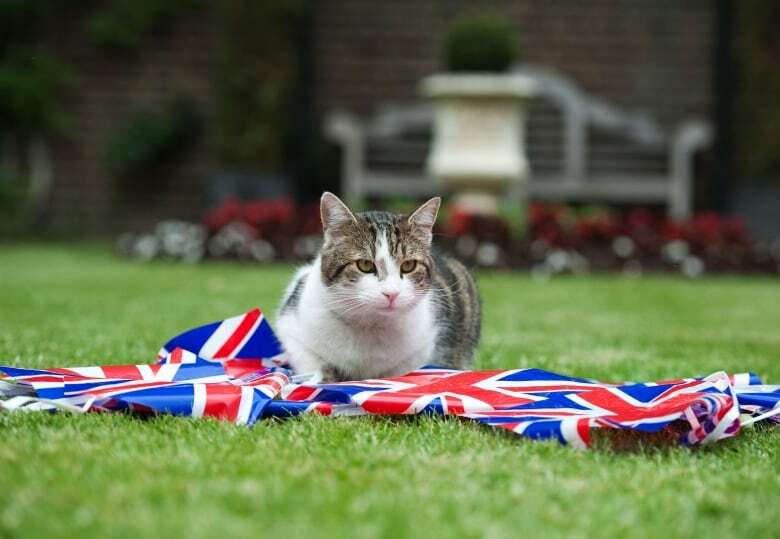 10, there is a brown-and-white tabby sporting a Union Jack collar that stalks up and down the halls. His name is Larry and the 11-year-old rescue cat holds the most important title of any feline in the U.K. — Chief Mouser to the Cabinet Office, a cat so important he has his own doorman. For the past five years, Larry has held this very real position. His career has outlasted that of former prime minister David Cameron and he now works under Theresa May, on hand to chase mice while she is at Parliament being chased by the media. 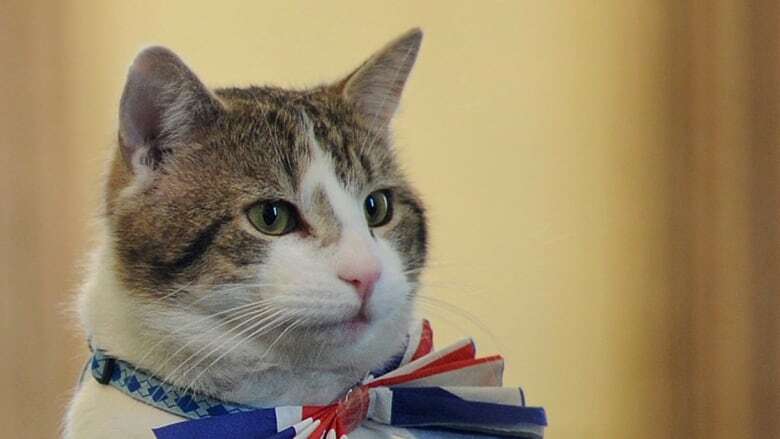 Larry is at the heart of the British political world and though he may not do much in the way of policy, he has become the furry face of a more relatable government. In a post-Brexit Britain, how is it that one cat in the Cabinet Office can hold such sway? Larry was hired by Cameron in 2011 for his mousing abilities upon recommendations from the Battersea Dogs and Cats Home. However, after taking up his post, it was discovered that Larry wasn't qualified for the job. "What we got wrong is that he actually turned out to be a rubbish mouser," says Lindsey Quinlan, head of catteries at Battersea. In fact, Larry was nearly fired in 2012 when Cameron spotted a mouse in his study and Larry failed to lift a paw or even wake up. But Larry's not going anywhere. Even though the tabloids have dubbed him "Lazy Larry," he has, according to the U.K. government website, apparently told the Cabinet Office the solution to the mouse problem is still in the "tactical planning stage." Since the reign of Henry VIII, cats have been working for the British government, but it wasn't until 1929 that the first official mouser was recorded. At that time, Britain, much like other countries, was in the midst of a depression. When the upkeep of a cat became too expensive, a request was made to the Treasury for one pence a day to care for the Home Office cat, Peter. "This is during one of the most testing times in British history but still people take a little bit of pleasure in this, in the cats that surround them while they're carrying out the business of government," says National Archives historian Chris Day, who is the author of Larry, The Chief Mouser And Other Official Cats. Although cats are not allowed in the Houses of Parliament, Larry has managed to be a focus of discussion among MPs. In his last question time as prime minister, Cameron made a point to address rumours that he doesn't get along with Larry by providing "photographic evidence" to prove their somewhat-unlikely friendship. 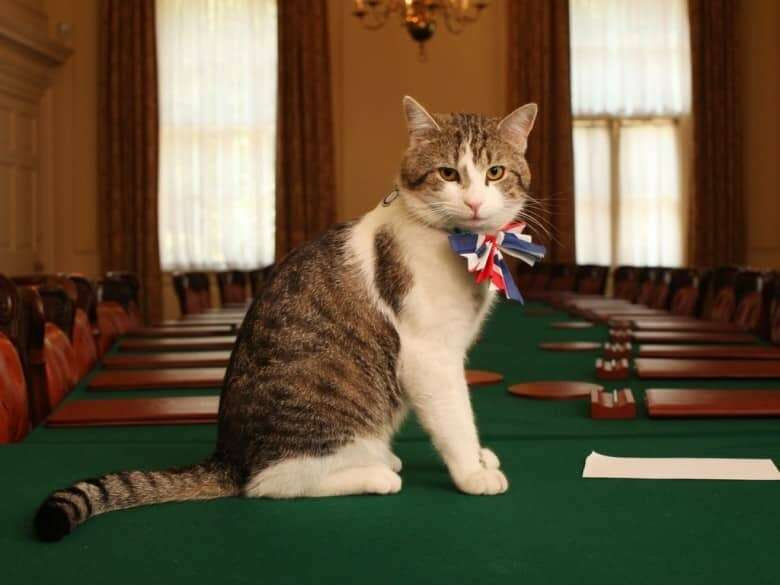 Everything from Larry's infamous brawls with Palmerston, the Chief Mouser for the Foreign and Commonwealth Office, to a Brexit-inspired collar change has made national news. But much like his No. 10 roommate May, Larry is in such high demand that very few journalists have been given access. While cats may not generate the most hard-hitting coverage, experts say Larry provides a much-needed break from Britain's current political situation. "At a moment of political tension or political conflict, as we have in the U.K. right now at the moment, particularly post-Brexit, this softer side of politics, softer form of communication, is quite attractive to government and the civil service," says Nick Anstead, an expert in political communications at the London School of Economics. "It humanizes government at a point where government seems so remote and seems to be something that people are alienated from." Government communications teams, journalists and the wider public have embraced Larry as a national icon. He has inspired books, cartoons and even fake Twitter accounts in his name. He can't speak, but many Britons have found a voice through Larry. "I think we like the idea that we get a glimpse in. Through Larry we can sort of peer behind the curtains and see what really happens at No. 10," says Robinson. "You get a more honest account of what happens behind the scenes from a cat because it's selfish and they put themselves first. They're never going to talk up their owners just for the sake of it." Ted Harrison, an artist and cartoonist who drew a serial cartoon for The Sunday Express about the life and times of Larry, was interested in him as a character because of his role as a mouser and political insider. "He also represents the idea that in politics there are likely to be rats everywhere and you never quite know which of your political friends is going to be the rat next time," says Harrison. "The cat is there to protect you." 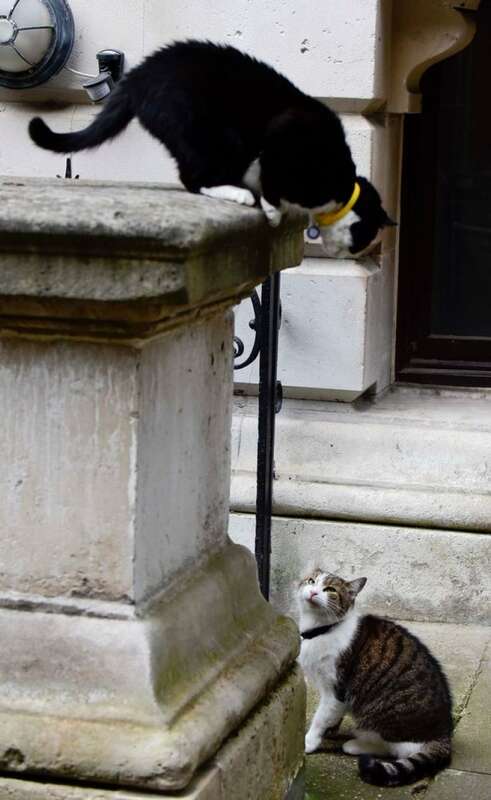 While Larry may not be the best at protecting Downing Street from real mice, he has provided an uplifting escape during an uncertain time in Britain. Post-Brexit, politicians and the public have found common ground in a common house cat. Like the stonework of Westminster, government officials can often seem cold and stoic, but historian Day says despite the power someone may hold, there is always a place for cats. "Everyone likes animals. That is something that is felt even in the corridors of power." Lauren Scott is a recent graduate from the bachelor of journalism program at Carleton University in Ottawa.